Fireplace Facades, Fireplace Surrounds, Fireplace Refacing, Fireplace Cladding & Fireplace Mantles. A fireplace is usually the focal point of the room, not only for the warmth of the fire but also for its decorative aspect. The fireplace facade draws attention to the fireplace, completing the style you have chosen for your space. 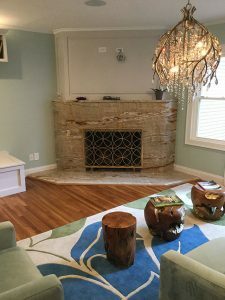 At Divine Design Stone & Cabinetry we want to share ideas about the different types of Fireplace Facades, Fireplace Surrounds, Fireplace Refacing, Fireplace Cladding, and Fireplace Mantles, from which you can draw from to renovate your fireplace installation. The new fireplace surround has to complement the overall decoration/design of your space. The materials must protect the home and surrounding areas from heat/fire. The materials will facilitate the distributing of heat to the appropriate areas. Finally, we must take into account the weight/load that is placed on your floors. There are classic materials such as natural stone or marble that are two of the most used for fireplaces, but there are many other options like Travertine that will serve to change the look and style of your fireplace facade or the fireplace surround of your space. These natural stone cladding are made of high-quality materials, handcrafted. There are facades for all types of fireplaces, front, angled, three-sided, mural, recessed, corner, central, suspended, with or without wood. Choosing one among the different types of fireplace refacing options does not have to be a complicated task. Depending on the decoration of the rest of the room you can choose between one material or another. Choose from a wide range of coverings to make your fireplace look like no other. Divine Design offers the possibility of any combination of styles and materials, such as Travertine, Marble, Granite, and other natural stones. As for the form, you can choose between traditional, contemporary, classic, rustic, or modern.